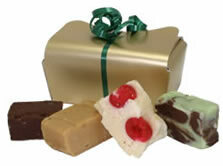 We are now displaying pictures of our fudges in a new section called "Identify Your Fudge and Ingredients"
Mail order gift boxes by post. 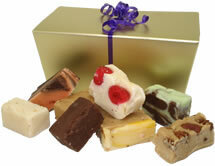 Any size boxes are available on request but you can immediately choose from the three sizes of box below, then pick the fudge you want in it - or simply tick for a selection. 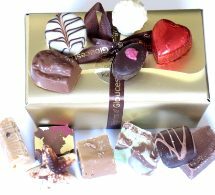 You can also send a free message with your gift or, if you would like a Special Greetings Card to be included, you will find an option at the checkout, together with a Gift-Wrap and roses option. Overseas airmail delivery: by weight. 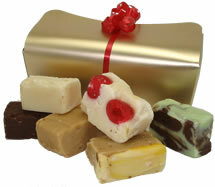 By popular request, this is a mixed selection of chocolates and fudges. "It is so refreshing to get some good customer service." Holly.